Derek Mackay wants the UK Government to make good on its pledge to 'end austerity'. Scotland's finance secretary has called on the UK Government to make good on its pledge to "end austerity" when the Budget is unveiled on Monday. 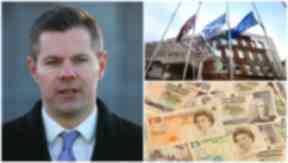 Derek Mackay has issued the call as Chancellor Philip Hammond warned that he is ready to introduce an "emergency Budget" in the event of a no-deal Brexit when the UK leaves the EU next March. On Sunday, Mr Mackay warned that any increases in Scottish funding cannot be offset by cuts elsewhere. Theresa May told the Conservative party conference earlier this month that austerity is over, and Scotland's Finance Secretary said the pledge should lead to action. Mr Mackay said: "The Prime Minister said austerity is going to end and I'm saying to the UK Government: show me the money. "That means a substantial, meaningful uplift in addition to the health commitments, which I welcome, and it must not be offset by cuts elsewhere." Chancellor Philip Hammond is expected to use Monday's statement to announce £900m in business rates relief for almost 500,000 small retailers. Mr Mackay said the Scottish Government would look at the detail of the rates relief and could pass on support to Scottish businesses. He added: "I'll look at the detail and set it in the context of the entire Budget to ensure that Scotland remains competitive and a place that people want to live, work and invest - but I will look at what other support we can do from the Scottish Government. "I am sympathetic around business rates because I want Scotland to be competitive and I want us to have a competitive advantage. "That's why we have the small business bonus, for example, where we've lifted 100,000 properties out of business rates altogether, and on rates reform we're recognising Scotland as being ahead of the curve on more frequent re-evaluations. "We've already put in place a number of measures to support businesses on domestic rates, and I will look at further measures following the UK Government's Budget." Scottish Labour leader Richard Leonard has called on the Chancellor to change the rules on Universal Credit and Child Tax Credits, while the Lib Dems want to see more certainty for businesses and public services amid Brexit negotiations. The Scottish Conservatives want the Scottish Government to spend "every penny" of extra funding from the Budget on health and social care.